perfect support V6.1.0-12 und V1.45 3DS/3DSLL/3DSXL/NDSiXL/NDSiLL/NDSi/NDS all machine systems. 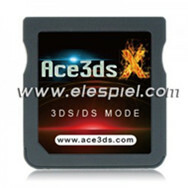 3DSGAMECARD: Update im Allgemeinen! Neue hoche Dichte Chip mit der schnellen Geschwindigkeit wird für die Update von Hardware benutzt. Das heißt, schnelle Game Geschwindigkeit und lange Zeit in Verbrauch von Batterie. Die Kompatibilität von Micro SD Karte ist besser. Die Chip Komponieren wird mehr wundbar, einfach und sie kann v6.1.0-12 und v1.45 und alle Konsole System untersützen, 3DS/3DSLL/3DSXL/NDSiXL/NDSiLL/NDSi/NDS. * Direct support for FAT16, FAT32, and computers, mobile phones, cameras, PDA communication without boundaries. * Multi-language interface, the decision by the kernel can be set directly on the DS console replacement. * Unique hardware high-speed transmission, supporting any TF card speed of the game without delay. * Dual graphical interface, thumbnails and the game title shows, full keypad and touch support. * Need to brush machine, built-in guide function that can guide the GBA side burn card. * Support high-speed large-capacity microSDHC memory card (4GB, 8GB, 16GB, 32GB). * Boot automatically reset to the previously selected game or application. * CleanROM support, no PC software, you can directly copy the game load faster. * Support sleep mode, to extend the standby time. * Support moonshell to read, write, support self-made software, open interfaces. * Power design, depending on the application of different best mode automatically. * Humanized operation interface, easy to use, easy to operate. * Support change the interface background. * Support brightness adjustment function. * Support NDS and IDS game, IDS game can run on any host. * Save directly to TF card, do not need to backup and recovery. * Automatically recognize the new game save type to update the database. * Simple and clear, one-button operation, without any setup or adjustment. * Support AR cheat code.